A few weeks ago I shared the first installment of How to Flip Thrift Store Clothes. Today I wanted to bring you some of the behind the scenes info because isn't that sometimes the best part? I'm easily distracted in a thrift store and before we could even get mic'ed up, I spotted this cute little skirt that would be just perfect for a New Year's Eve party - i mean, can you even with that fringe?? When doing thrifting videos, I always take care to point out things people should pay attention to. I inspect the bottoms of any shoe that catches my eye - often times details like where a shoe is made or the materials will be printed here. I swoon when I see Made in Italy and Genuine Leather! It's also important to know the difference between brands you like and what is selling in resale stores. 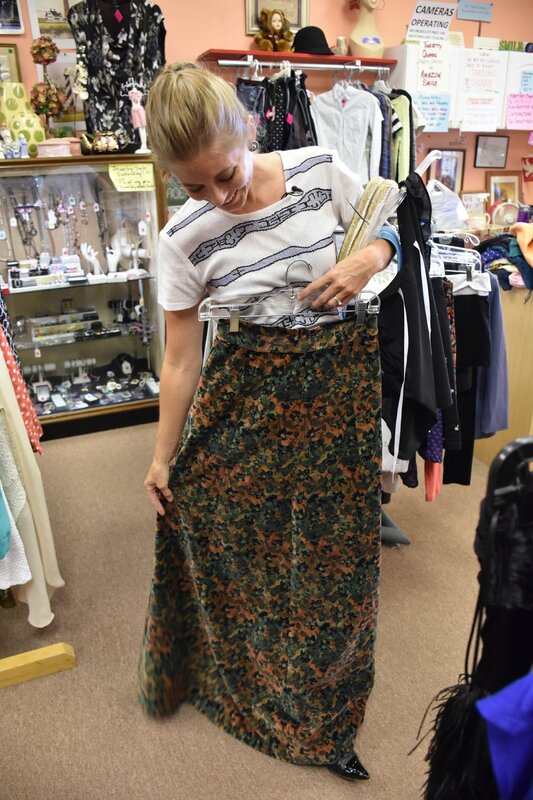 Vintage items are great if you love them for yourself or you have a vintage store, but most resale stores will be looking for modern day fashions - think H&M, LOFT, GAP for young adult brands and J. Crew, Kate Spade, etc. for higher end/woman oriented brands. I SO wanted the purple skirt for Gen. Co., but in typical me fashion, didn't want to spend the $12 for it. It was a great vintage find! And of COURSE I found a few items that I couldn't leave without! I picked up the white shoes for a themed event I was attending and this gorgeous thick, floral, fall skirt needed to be mine. I still haven't worn it, but I'll just blame that on the heat of summer. It's also about 6" too long, but nothing a good tailor can't fix! I also snagged a fun, brightly colored belt that's made an instagram appearance. Many thanks to Katie who shot all these behind the scenes photos and who introduced me to The Thrifty Quaker. Thrift friends are the best friends! You can read Jen's article here and watch the video below!